Troops have also been put on full combat alert in response to the estimated 40,000 Russian troops massed on the border. Anti-government demonstrators storm the regional police station in Krasnoarmiisk, Donetsk region, eastern Ukraine. UKRAINE’S ARMY LAUNCHED what insurgents said was a full-scale military assault on the flashpoint town of Slavyansk, raising the stakes in the stand-off with Russia, which has vowed “catastrophic consequences” if Kiev stepped up operations. Gunfire and explosions were heard near the rebel-held town and a spokeswoman for the insurgents in control of Slavyansk claimed their fighters had shot down an Ukrainian helicopter – something which was later confirmed by the government. Interior Minister Arsen Avakov announced the pilot’s death on his official Facebook page, confirming information from the insurgents. An AFP reporter on the scene saw a column of eight armoured vehicles breaching a rebel-held checkpoint just south of Slavyansk. The raid marked a dramatic escalation in the crisis and came a day after Ukraine’s interim president reintroduced conscription amid fears of an imminent Russian invasion. Oleksandr Turchynov has also put his armed forces on “full-combat alert” in response to the estimated 40,000 Russian troops massed on the border. He has admitted his authorities are powerless to stop a growing insurgency in the eastern part of the country, where pro-Russian rebels have seized control of more than a dozen towns and cities. 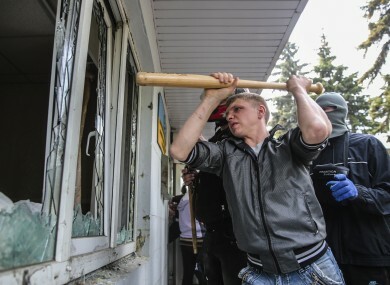 A violent group of 300 or so young militants late Thursday stormed the prosecutor’s office in the industrial hub of Donetsk, hurling petrol bombs and rocks at overwhelmed riot police. Ukrainian media reported that a prosecutor’s office in the town of Horlivka and a police station in Krasnoarmiysk were also overrun. As the crisis rapidly spirals into the worse East-West confrontation since the end of the Cold War, US President Barack Obama was due to discuss the tensions with German Chancellor Angela Merkel at the White House later Friday. Helicopters were seen circling low over Slavyansk, which has become the epicentre of rebel activity in the increasingly chaotic east of Ukraine. Eight armoured vehicles and several soldiers were seen taking position at a checkpoint just to the south of the town and warned off anybody trying to approach. Sporadic small-arms fire and three explosions were heard at a distance. Rebels had set at least one roadblock on fire to produce cloaking smoke. Central Slavyansk itself was relatively calm, but the town’s church was ringing its bells to alert the population of 160,000. The self-styled rebel mayor of the town, Vyacheslav Ponomaryov, has been warning for several days that the Western-backed authorities in Kiev would attack the town. In what they call an “anti-terrorist” operation, the Ukrainian forces had for days encircled the town to prevent the insurgents receiving reinforcements. Russia’s foreign ministry said on Thursday that any effort by Kiev to intensify its military operation “against its own people” in the east could have “catastrophic consequences”. The military advances in Slavyansk could also jeopardise efforts to free 30-50 hostages being held in Slavyansk, including seven European monitors from the OSCE. Hopes had been raised in recent days that the seven — four Germans, a Dane, a Czech and a Pole — might soon be released as Ponomaryov said negotiations were going well. Ukraine has accused the rebels in Slavyansk of wanting to use them as human shields. Germany appealed to Russian President Vladimir Putin to intervene to win the monitors’ freedom. The Kremlin strongman responded that Kiev should end its military operations in rebel-held territory. That sparked a derisive response from the White House. The West and Kiev believe that the chaos in eastern Ukraine is being sown by Moscow in a bid to destabilise the former Soviet republic ahead of planned presidential elections on May 25. Kremlin has denied the charges, but has reserved the right to use troops to protect Russian speakers in eastern Ukraine, a region that has deep cultural and historical ties to Moscow. The Western response has been to launch sanctions against members of Putin’s inner circle and target key firms in a bid to attack Russia’s already recession-hit economy. Moscow has reacted angrily, threatening to retaliate against Western interests in the lucrative energy sector but has vowed a measured response. Russia “will not rush to do anything stupid”, Foreign Minister Sergei Lavrov said on a Thursday trip to Latin America. All eyes are now on Obama and Merkel’s meeting in Washington to see what the West’s next move will be. But the IMF has warned that the loan, $3.2 billion of which is available immediately, would need to be “re-designed” if Kiev were to “lose effective control over the east”. The unrest in Ukraine, which started with peaceful demonstrations in Kiev in November against pro-Kremlin president Viktor Yanukovych’s decision to ditch a pact for closer integration with the EU, has rapidly degenerated into a full-blown global crisis. After a deadly crackdown on protesters, Yanukovych was forced out in February, sparking fury in Moscow which responded with a blitz annexation of Crimea. The pro-Russia rebels who have been steadily taking more ground in the east vow to hold their own Crimea-style “referendum” on independence on May 11 — two weeks before the nationwide presidential vote. Email “Military helicopter shot down as Ukraine army launches assault on insurgents”. Feedback on “Military helicopter shot down as Ukraine army launches assault on insurgents”.